SOLVED: Elizabeth Levitt Where Are You? Genealogy solved! John, Elizabeth and Richard Levitt have been found – hiding as a ‘Harding’ in the 1871 Swaffham Bulbeck census from Cambridgeshire. Last night, after posting about how I was struggling to find some Levitt relatives on the 1871 census, I stumbled across them. I’d spent quite some time trawling through records on sites like FamilySearch.org, Ancestry.co.uk and FindMyPast. I even manually went through each folio scan one-by-one, courtesy of my copy of the 1871 census for Cambridgeshire from S&N Genealogy. There was no sign of them at all in Swaffham Bulbeck. Assuming that all three had perhaps eluded the census enumerator (as a few people did), despite being in the same place before and after this census, I gave up and put them aside for another rainy day. One last little search on Ancestry.co.uk just before retiring for bed saw me searching very vaguely for any John and Elizabeth in Cambridgeshire 1871 with a John being born in 1838 or 1839. A list of search results appeared and nothing remotely Levitt, Livett, Levet, Levit etc stood out. So I thought that I would just work my way through a few and started clicking to view the census returns regardless of the surname it had turned up – after-all I had exhausted all other search ideas. The Levitt family were 'hiding' as Hardings. John and Elizabeth Harding were just one of these, and after clicking through and staring at the census return for a few seconds, I noticed that Elizabeth Skeel was living immediately next-door aged 90. This was significant as Elizabeth Skeel was an ancestor – that was certain. She was the mother of the Elizabeth Levitt that I was looking for. I then noticed that one of the Hardings was a 27yr old unmarried Richard S Harding. Again, Richard Skeel Levitt never married and would have been 27yrs old. So who were the Hardings? Well, amongst John and Elizabeth Levitt’s children was an Ann Maria Levitt born about 1841. She went on to marry a George Hunt Harding. This fact help me unravel what I was staring at. John ‘Harding’ was noted as the ‘Head’ of the household, with Elizabeth ‘Harding’ noted as his wife. 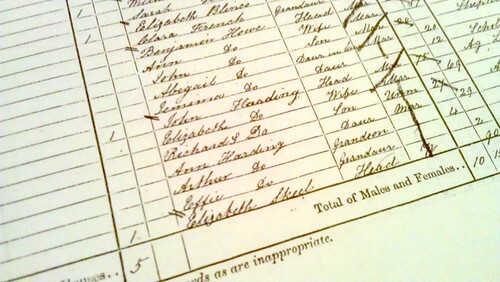 Then, the unmarried Richard S ‘Harding’ was listed as the son. Following him was the married Ann Harding noted as the daughter, and lastly two children noted as ‘grandson/granddaughter’. This doesn’t exactly make sense. At first glance, you might have thought that Richard and Ann were married with two children and were living with his parents. If Ann was Richard’s wife, then she would have usually been noted as something like ‘son’s wife’ or ‘daughter-in-law’. Noticing Richard’s marital status was the final piece of the jigsaw. One question here is though, and maybe it was one that confused the enumerator, was that whilst Ann Harding is noted as married, there’s no sign of her husband George. I’ve started looking for him, but as yet, he’s missing… so the search starts again! I do believe that Elizabeth Skeel was my great, great, grandmother being the mother of John Levitt who married Sophia Howard. They had 12 children one of which was my grandfather Asher Levitt born 1875.